In May, I have three appearances in Southern California—and I’ll be appearing with Edwidge Danticat in Miami May 21!!! I am not officially on book tour, but it feels that way! I’m honored to be a part of a group show at the Pounder-Koné Art Space, where my novel Blood Colony will be featured in “Cooperative.” The show runs May 7-31. I will attend the opening reception from 6 to 9 p.m. May 9 (Saturday), and I will return to read from Blood Colony at 3 p.m. --CORRECTED TIME--Sunday, May 17. The gallery’s address is 3407 Glendale Boulevard in Atwater Village (Los Angeles). 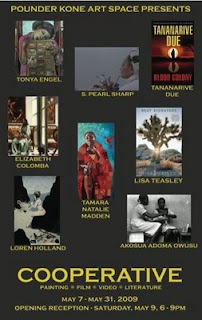 "Cooperative” features women painters, filmmakers and writers, also including Elizabeth Colomba, Julie Dash (Daughters of the Dust), Meri Nana-Ama Danquah, Tonya Engel, Loren Holland, Tamara Madden, Akosua Adoma Owusu, S. Pearl Sharp and Lisa Teasley. My book reading is at 7 p.m. Sunday, May 17. If you’ve never been to the Pounder-Koné gallery, please come get an introduction. Like so many people, I have a lot to learn about art…and the shows here are terrific. The gallery is co-owned by marvelous actress CCH Pounder (“The Shield”), who is a gracious hostess. I’ve seen her personal art collection, and her taste is really special to behold. As a novelist, I’m just happy to be invited to share a night with fellow artists in a beautiful place. I’m an alum of Northwestern University, and I’m attending my first NU Club of Los Angeles event: The “Author, Author! NU Authors Bookreading” scheduled from 3 to 5:30 p.m. Saturday, May 16. The event is at the Studio City branch of the Los Angeles Public Library, 12511 Moorpark Street in Studio City. Also appearing: screenwriter and novelist Allison Burnett (Fame and Feast of Love); playwright, screenwriter and novelist Sally Nemeth; Richard Bangs and Douglas W. Kmiec, a Catholic law professor who was denied communion in Los Angeles for supporting Barack Obama. Admission is free and open to the public. Books will be on sale for signing. 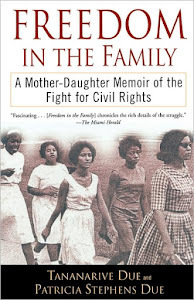 I am appearing with Edwidge Danticat in Miami, and I couldn’t be more excited! 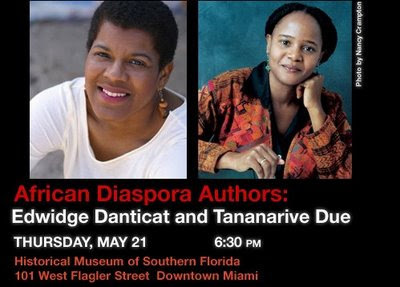 We’re taking part in a program entitled “Black Diaspora Authors: Edwidge Danticat & Tananarive Due” at the Historical Museum of Southern Florida in Miami. First, I don’t make it back home to Miami nearly enough, especially since my parents moved to upstate Florida. And secondly, Edwidge Danticat is a treasure in world letters—both in fiction and nonfiction. Her latest book, Brother, I’m Dying, chronicles the painful journey of her Haitian uncle, who died while neglected in custody of U.S. customs; winner of the National Book Critics Circle's Award for autobiography. Edwidge and I will read from our work and discuss how living in South Florida has influenced our writing. I feel honored to appear with her. The event is at 6:30 p.m. Thursday, May 21. The Historical Museum of South Florida is at 101 W. Flagler Street in Miami. For information, call 305-375-1492.